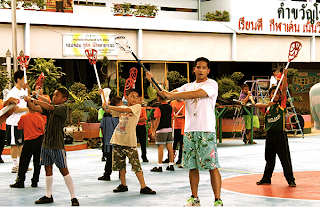 Many of you may not know this, but our two time captain, and recent 2011 grad, Peem Chatikavanij started an after school program in Thailand that helps keep kids off the streets, and away from drugs. Read below to get some insight into what Peem is dealing with, what he has done about it... and most importantly, how one person can change the world for so many! Damn Proud Peem. Way to go!! Coach - How are you doing? How is your summer going? Mine has been extremely hectic. I have been working for a branch of Loxley Corporation. The division is called CSR or Company Social Responsibility. The program works with the surrounding community, which happens to be one of the largest slums in Bangkok. I am currently working on a project that integrates lacrosse into the school system in the slums in order to occupy the kids and ultimately distract them from doing drugs and video games addictions. Recently, drugs had been a huge problem in the slum schools due to the lack heavy handed policy by the previous government to combat this problem. Just to give you an idea, these slum kids would leave school at 3pm. However, their parents wouldn't be back from work until 5:30 pm. They have this two and a half hours slot to get involved in drugs or other substances. One incident really hit home for me. The Headmistress at the school told me that in June, they lost one 4th grader to heroin overdose. The kid got it from a drug dealer who he had been running errands afterschool. I primarily work with kids between 2nd-6th grade. It's amazing how much these kids are exposed to drugs - you wouldn't think that a 3rd grader would have the capabilities to do it. There are alot of drugs running in the slums and children are usually forced to carry the supplies for the dealers... or even worse, if their parents are dealers, then the kids are force to "guard" their drug supplies. So I decided to use lacrosse to distract the kids from these bad behaviors. Why lacrosse you may ask? 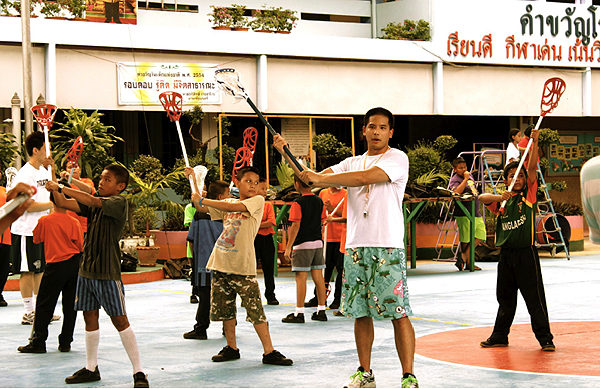 Well it doesn't require alot of space (we use the simplified version of the game), I know the game very well to the point that I could teach it, and it's a new sport in Thailand, which allows it to have a "wow" factor that attracted alot of kids to the program. To see the two most recent article in Inside Lacrosse on Peem and his program - click here! and here! P.S. come back and visit bates 2nd semester??? ya?? Thank you very much for sharing this, it looks like you really had a great time. I hope to visit Thailand very soon, thank you. I hope to can visit Thailand soon after my vacation here in India.